The Green Court is now at the centre of the School. 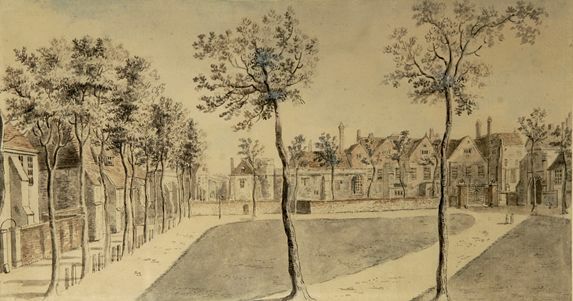 There have been lime trees around the Green Court since at least 1708. Among them are now ones commemorating Headmaster Thomas Field and his wife, William Harvey OKS, Headmaster Peter Newell and his wife Mary, and Frederick Cleary. In 1812, the Dean pronounced: “The Dean and Chapter, though possessed of the sole exclusive right of the Green Court for the purpose of exercising their horses, etc., allow nevertheless the scholars of the King’s School the free liberty of playing”, so long as they “are not injurious to the persons and premises of the inhabitants there”. Cricket was played here in the mid-nineteenth century and athletics sports were held from the 1860s, with the 100 yards run diagonally from the Dark Entry to the Norman Staircase. Around the Green Court can be seen Lardergate, Lattergate, the Memorial Chapel, the Memorial Court, the Schoolroom, the Norman Staircase, the Dining Hall, Hodgson’s Hall, the Priory Block, the Forrens, Marlowe House, and the Dark Entry.